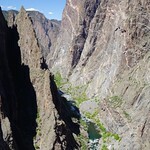 A 2-day intro to Black Canyon. I will have to come back. 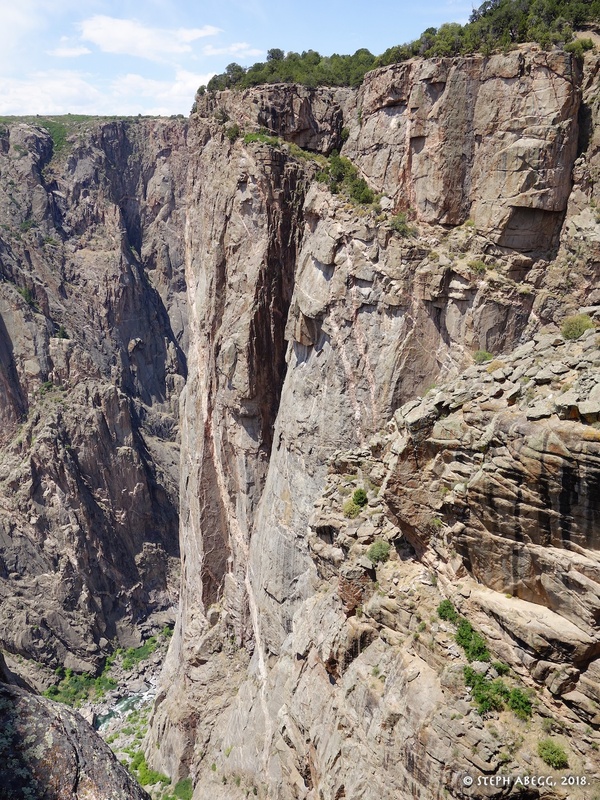 The Black Canyon of the Gunnison in western Colorado is a deep and narrow canyon with 2000-foot vertical walls on either side. 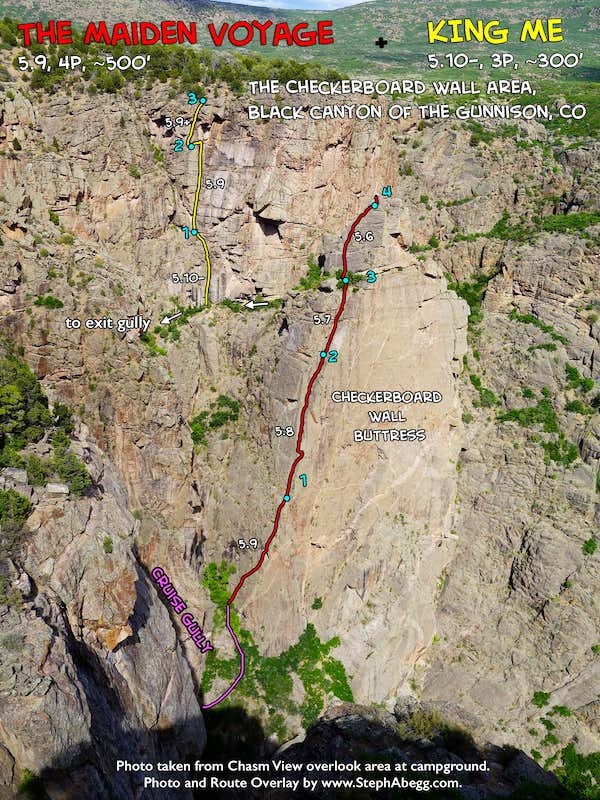 For climbers, "The Black" is known for its remoteness, tick and poison ivy infested approaches, loose and unpredictable rock, difficult and unprotected pegmatite bands, challenging route finding, and its long and committing routes that top out on the canyon rim. 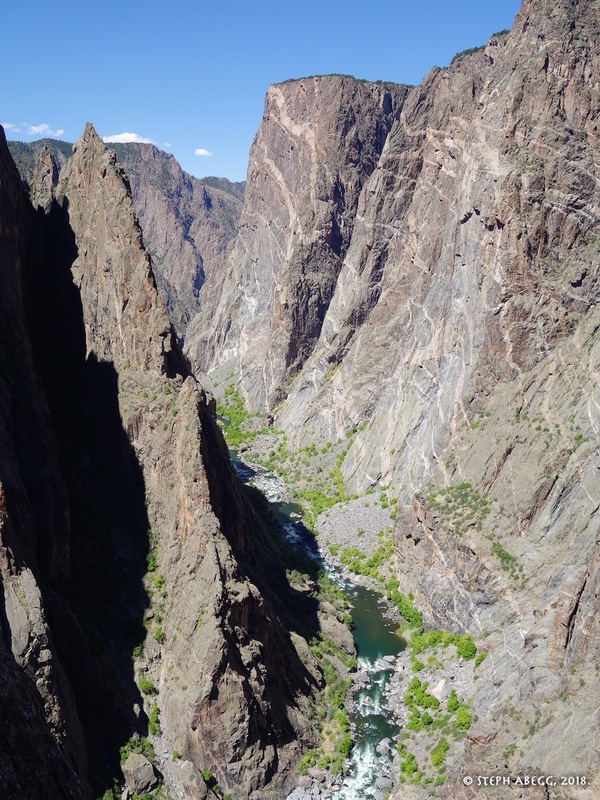 Ever since I heard about it, I've been intrigued by the Black Canyon, but since Colorado is over 20 hours drive from my home in Bellingham, Washington, I rarely make it that far during my summer adventures. 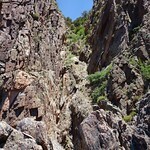 Plus, the Black Canyon is quite hot in the summer months, which is when I do the bulk of my climbing. 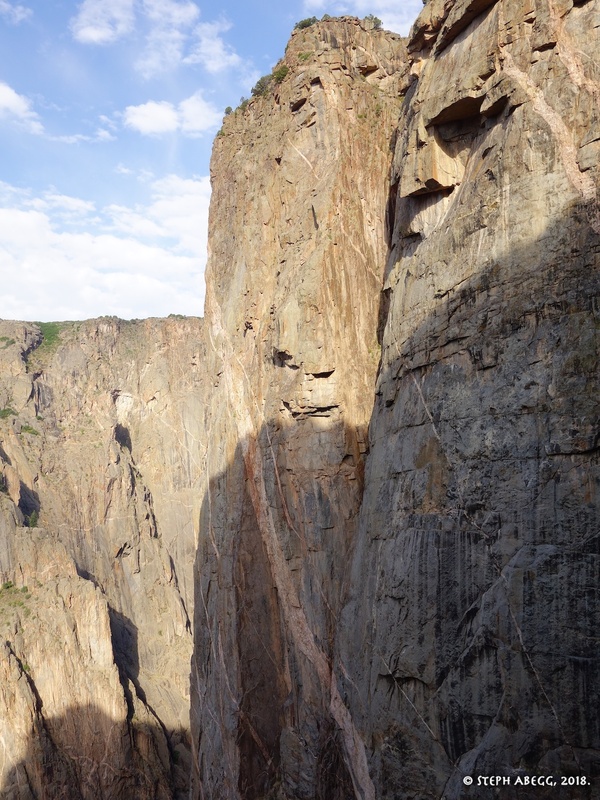 Finally, in Summer 2018, I made an extended climbing trip to Colorado, mainly in the Rocky Mountain National Park area. 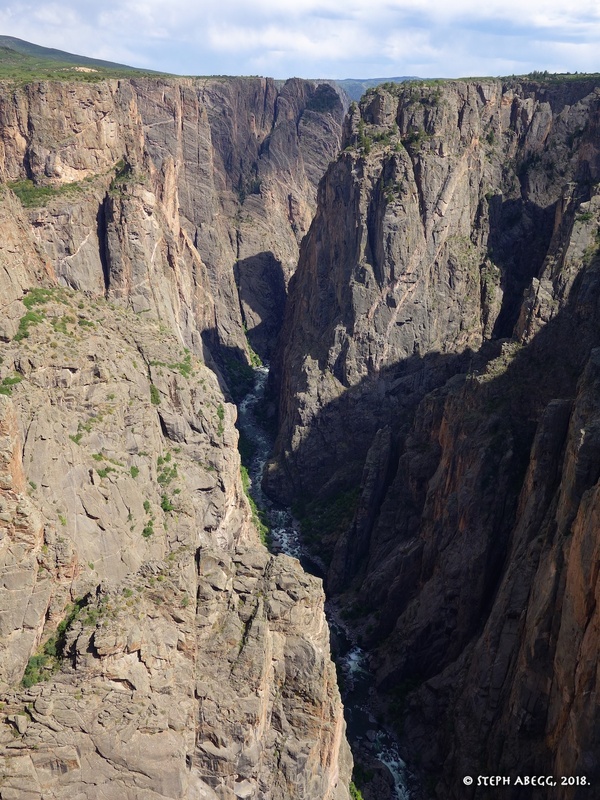 I had started my summer roadtrip in California, so the Black Canyon was right on my driving route from the Sierra to RMNP. 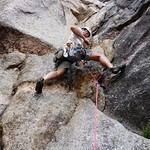 I made a partner post on mountainproject, hoping I could find someone willing to brave the heat and climb for a couple of days in The Black. 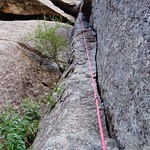 Tony Bubb responded to my post, rationalizing that although it would be hot at The Black, it would at least be a good place to avoid the 4th of July crowds at other climbing areas. 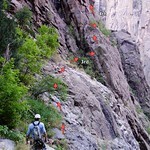 On the first day, Tony and I climbed Comic Relief. 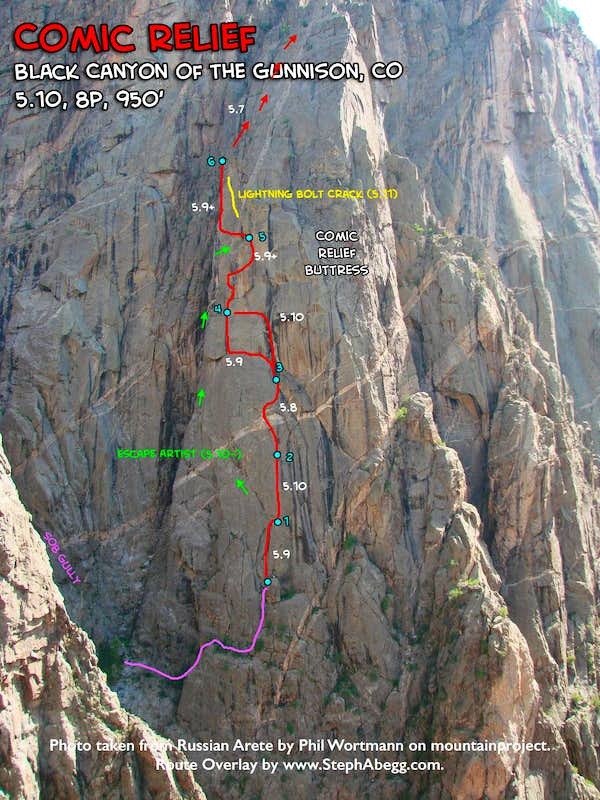 This 9-pitch, 950-foot route is considered by many to be one of the best 5.10 routes in The Black, featuring solid rock and interesting climbing. Indeed, it was a great route. 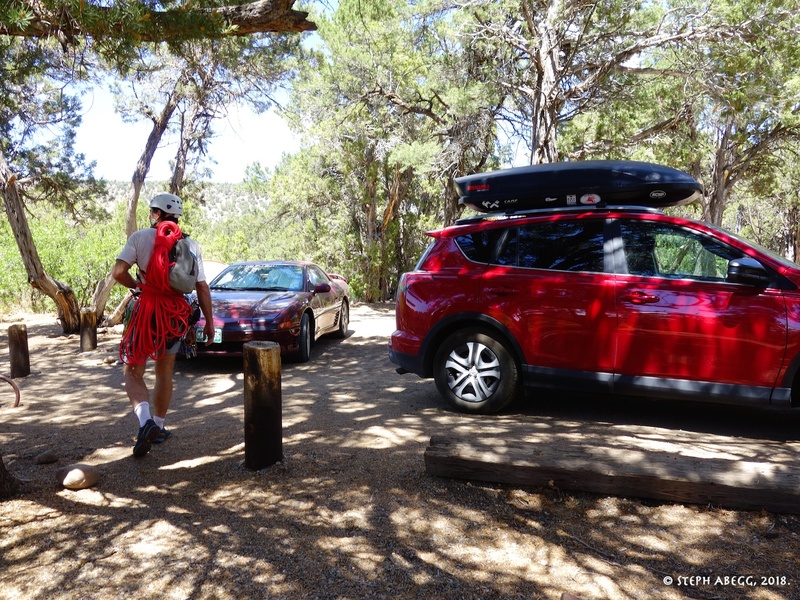 Perhaps most importantly, Comic Relief is one of the few routes on the North Rim with morning shade, a must for a summer day in The Black when the dark rock bakes in the 90° sun. 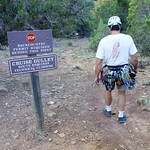 We started early, and the temperatures during the climb were surprisingly tolerable in the shade, comfortable even. 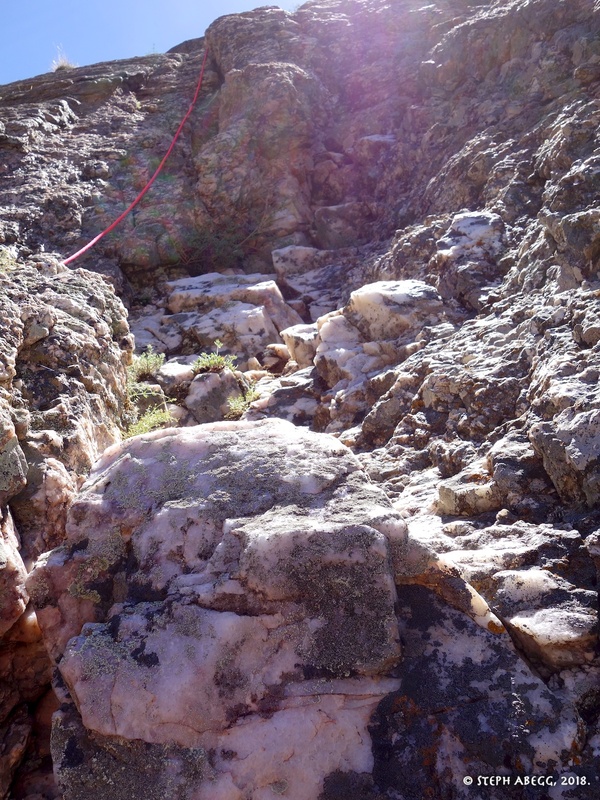 We climbed the Escape pitches all the way to the rim (avoiding the hot hike up a gully to the rim); one of the perks of climbs in The Black is that many of them top out right on the rim, mere minutes from the campground. 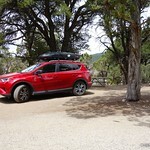 In fact, the Escape pitches topped out 100 feet from our campsite! 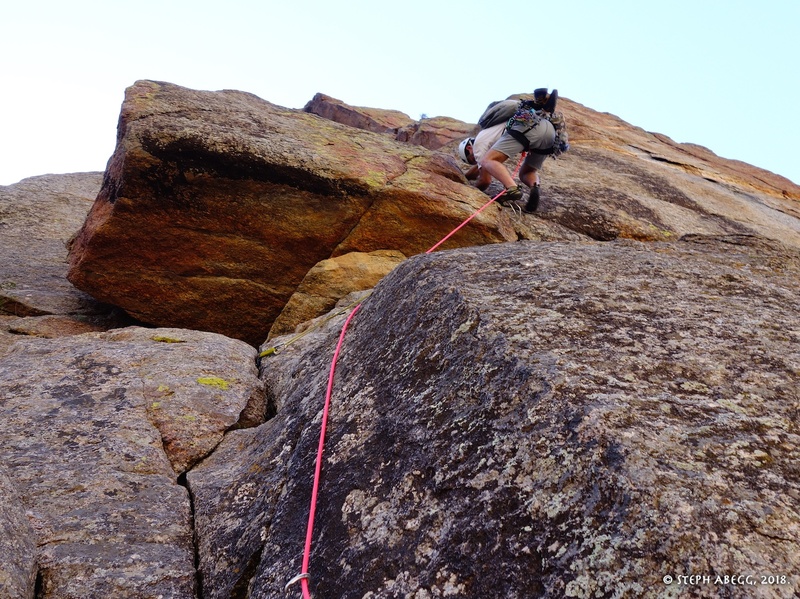 On the second day, we linked up Maiden Voyage with King Me for 7 pitches and about 700 feet of climbing. 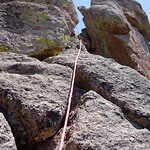 Like Comic Relief, these routes have morning shade so we were fairly comfortable. 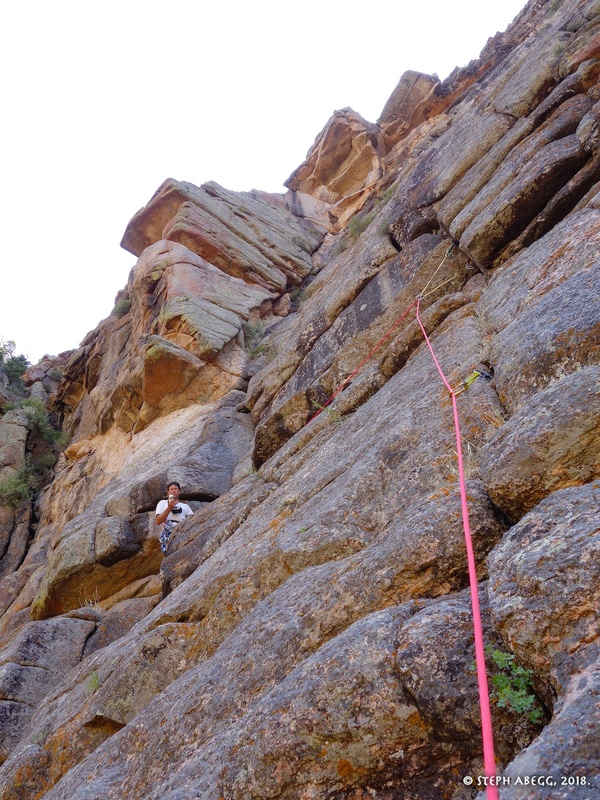 Maiden Voyage is one of the most popular routes in The Black, mainly because it is quite moderate, low-commitment climbing on good rock with a nice line up the edge of Checkerboard Wall. 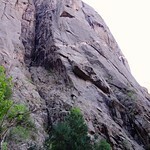 And King Me features some excellent 5.9-5.10- face and wide crack climbing. 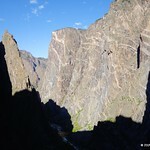 Linking Maiden Voyage with King Me was a great way to climb all the way to the rim rather than hike up a gully to the rim as many parties do after climbing Maiden Voyage. 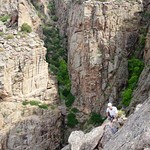 The best part was, on both days we were one of two parties climbing in the canyon, and we never did see the other party. 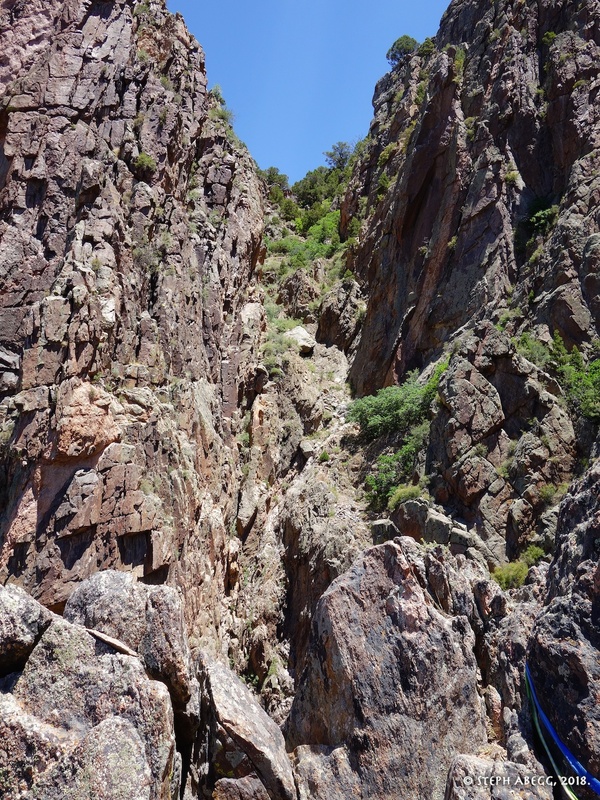 It was like we had the entire Black Canyon to ourselves, which added to the feeling of wild remoteness. 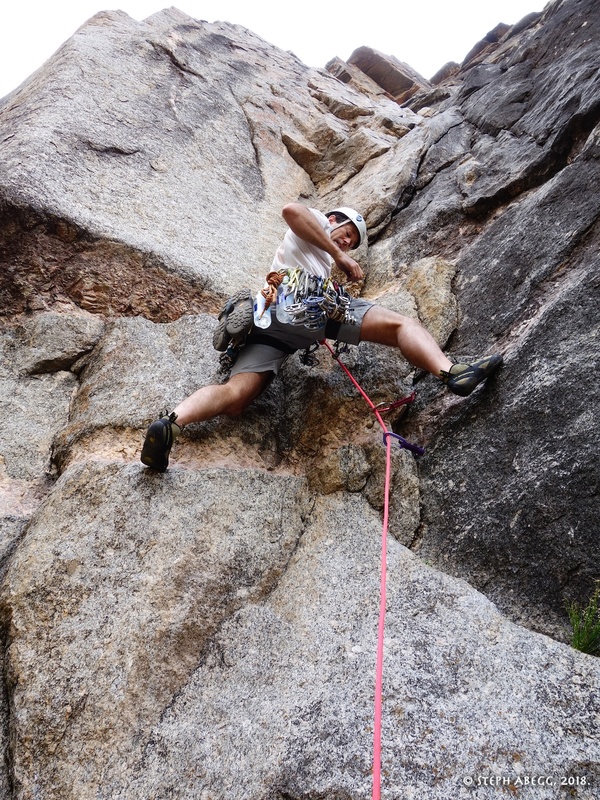 Comic Relief, Maiden Voyage, and King Me are relatively tame climbs by Black standards, but they were a comfortable choice for the hot weather and a great introduction to The Black. 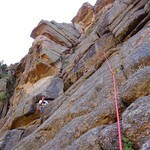 I will come back some day, to climb some longer routes such as Scenic Cruise, Journey Home, Russian Arete. 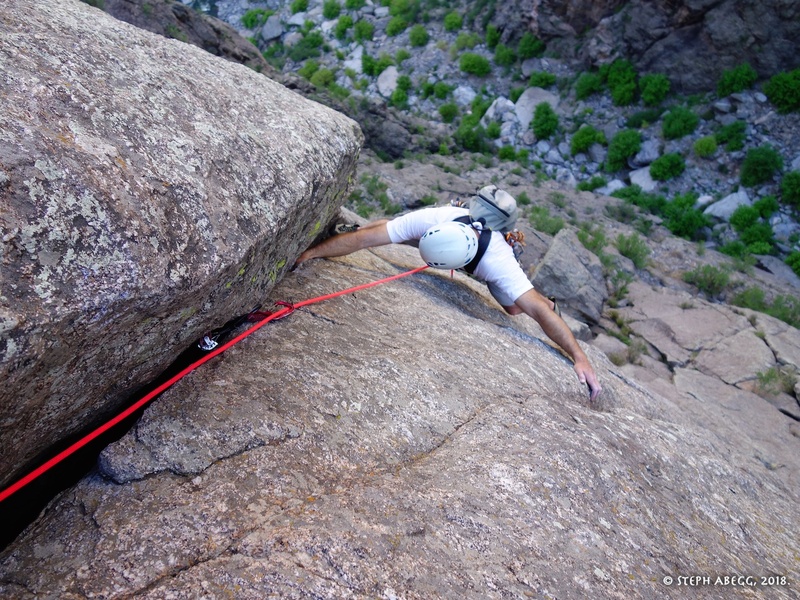 This page gives a trip report for our two days of climbing in The Black. Thanks Tony for being an excellent partner! 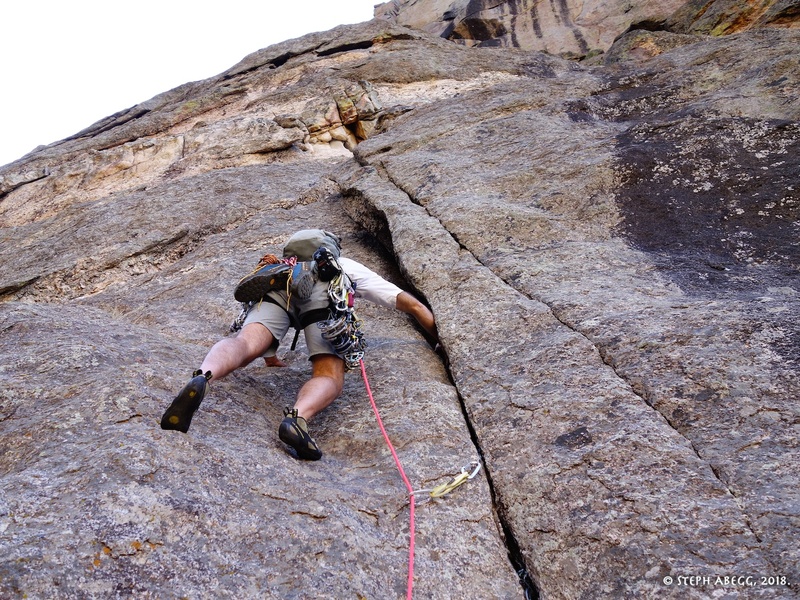 Comic Relief is an excellent introduction to 5.10 climbing in the Black, with clean rock, good pro, easy routefinding, and a relatively short day. 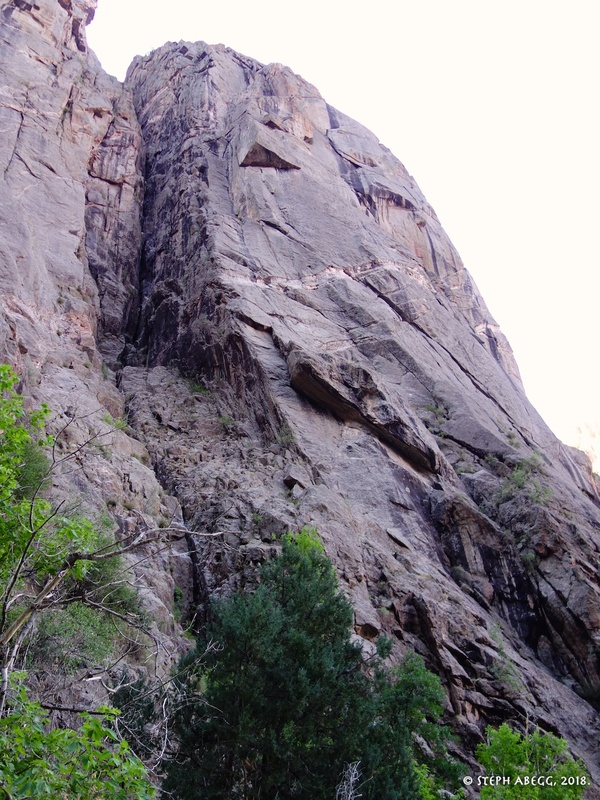 The climb stays in the shade until early afternoon, so it's a good choice for hot weather. 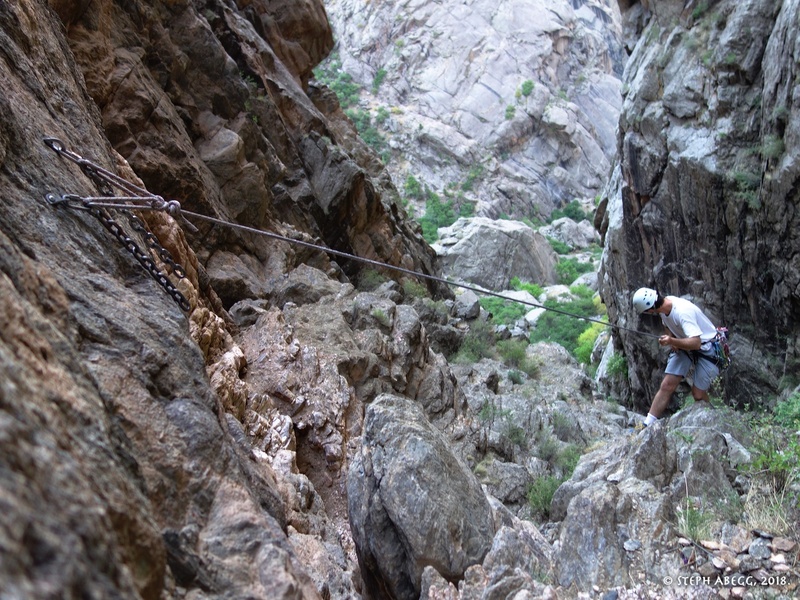 This is one of the more popular routes in the canyon. Descend the SOB gully almost to the river, to a white, polished slabby area under the third prominent buttress on your left. 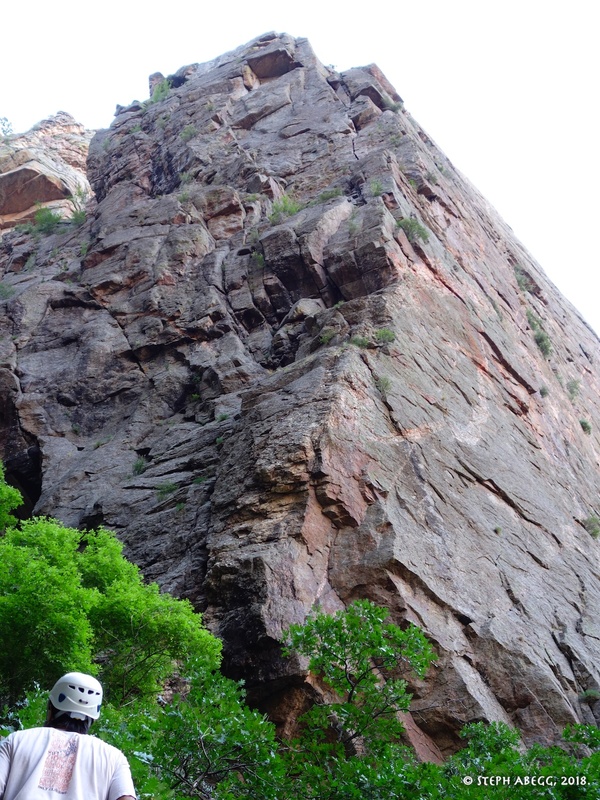 Scramble up to a large vegetated area below the wall; from here, scramble 4th and easy 5th class up and right to a small ledge below the obvious left-facing corner with a finger crack (the "Vector Traverse" on Escape Artist goes up and left from here). 1. 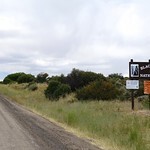 The start of the SOB Gully is clearly marked with a sign, and starts on the road between the campground and Ranger Station (left side as you head away from campground). 2. Poison ivy in the SOB Gully. 3. Comic Relief Buttress as seen on the approach. 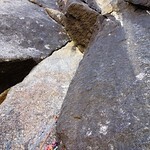 One obvious feature to help identfy the buttress and the start of the route is the "Vector Traverse" on Escape Artist. 4. 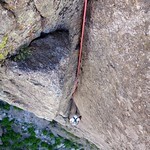 Annotated photo of the ledge system to get to base of Comic Relief and Escape Artist. 5. 4th class scramble to base of Comic Relief and Escape Artist. 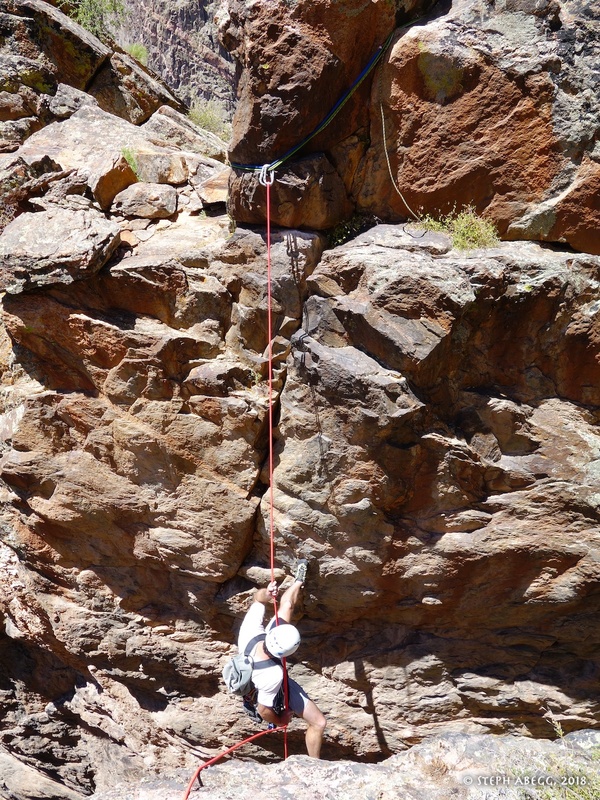 We put on rock shoes but did not rope up for this. 6. 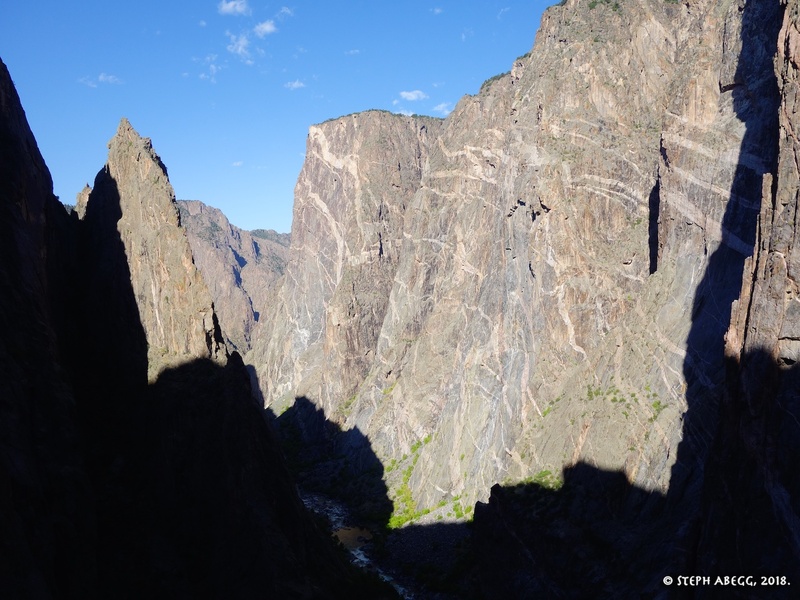 Morning sun on the steep rugged walls of the Black Canyon of the Gunnison. 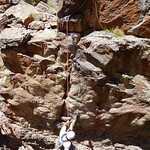 We were climbing on the shady side of the canyon. 5.9. 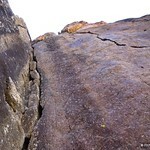 Begin in a nice 5.9- corner which leads to the base of the arching crack. 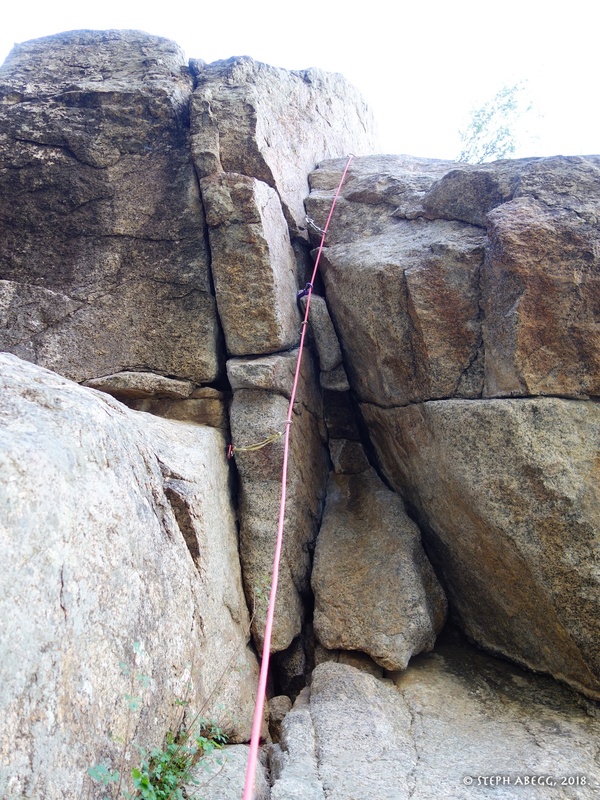 Belay at the base of the arching crack, or keep going to link Pitches 1 + 2. 7. 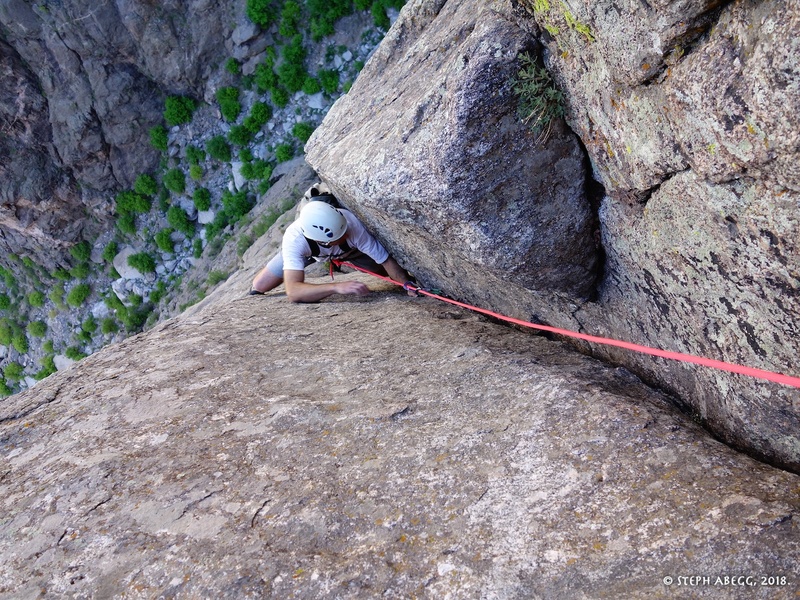 Tony staring up Pitch 1 of Comic Relief, a fun 5.9 crack system. 8. 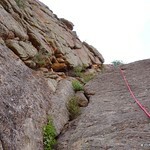 Second half of Pitch 1. 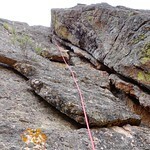 5.10 (crux). 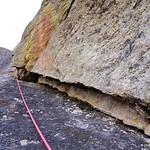 Climb the arching crack (fingers/layback crux) and continue up sustained 5.9 crack to a belay ledge. 9. Pitch 2. 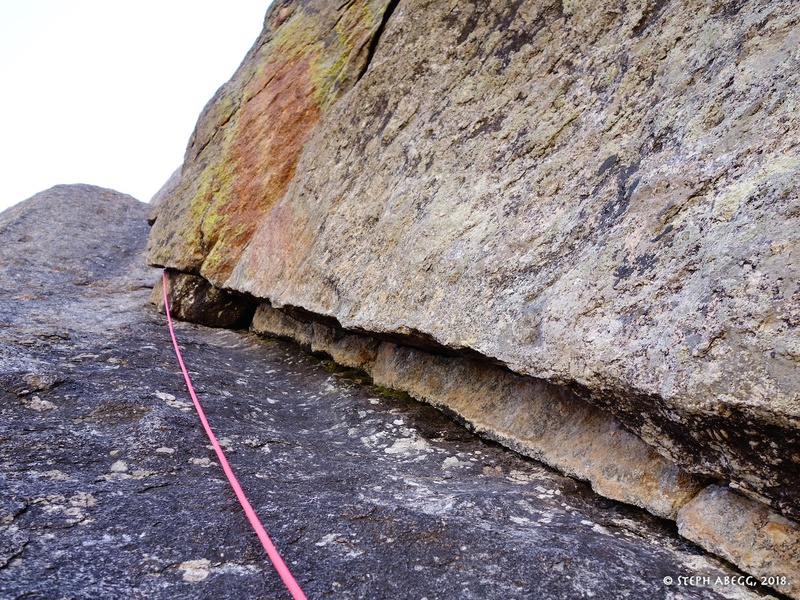 This is the crux pitch of the route (5.10). 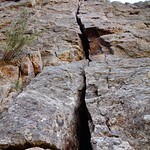 The crux occurred in first 20 feet for me. It was less of a finger crack and more about placing weight in the right directions, which was a bit tricky to do and place gear at the same time. 10. 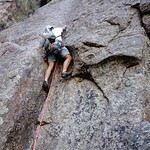 Tony nearing top of Pitch 2. 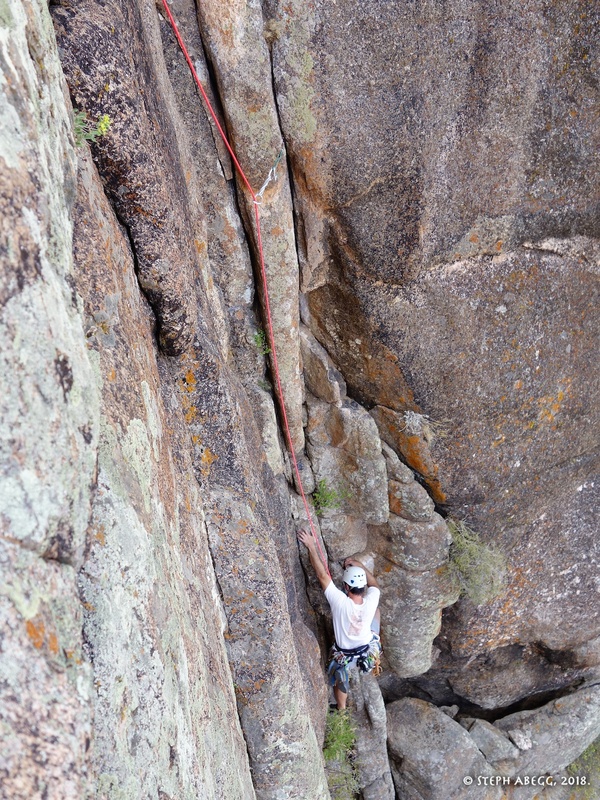 The upper part was fun 5.9. 5.7. 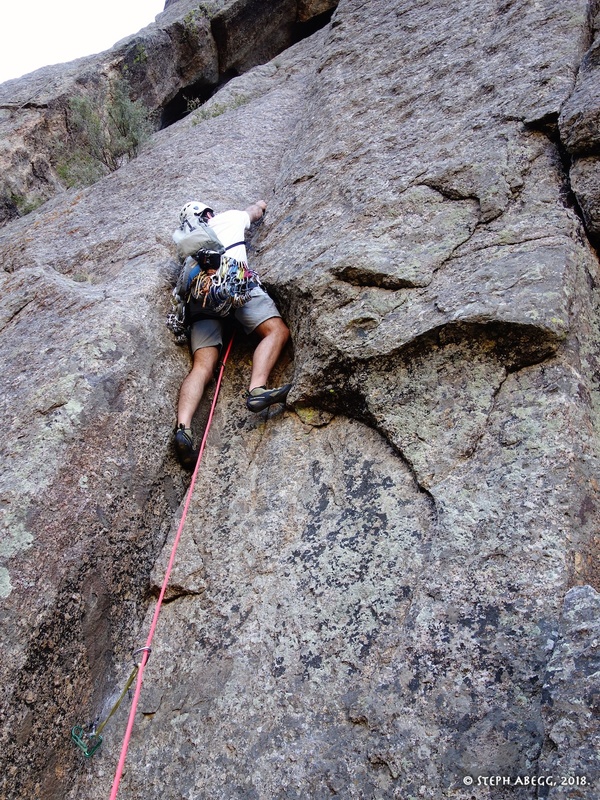 Climb the left facing corner, traverse right at its top, continue up easy ground/slab to another short corner, and climb it to a good belay stance below a steep black corner. 11. Tony starting up Pitch 3. 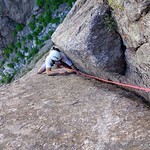 This pitch is pretty moderate, 5.7. 12. 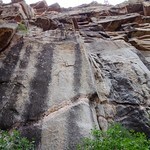 5.7 corner near the top of Pitch 3. 5.9 or 5.10. 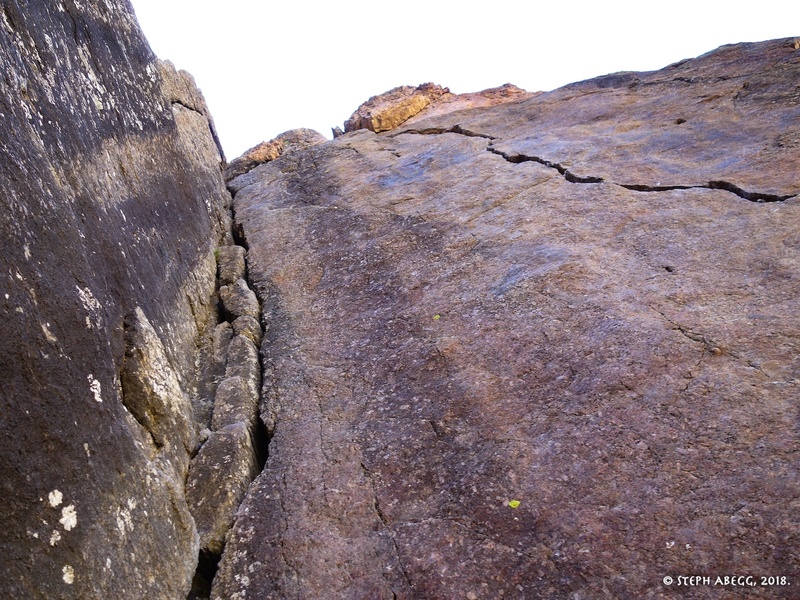 Traverse left to a flared corner (5.9) with good hands which leads to a nice ledge. 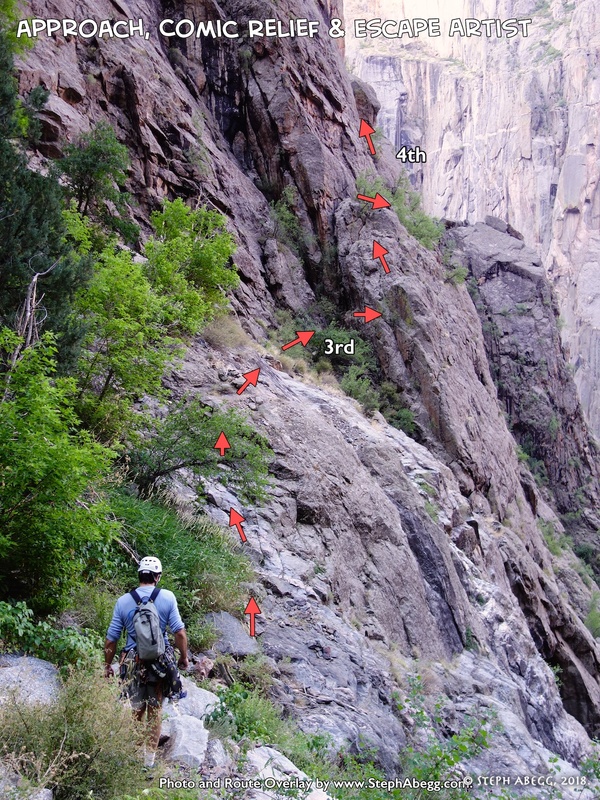 Variation: Climb the strenuous "Black Corner" above (5.10), then hand traverse straight left (supposedly 5.6) to the belay ledge. 13. 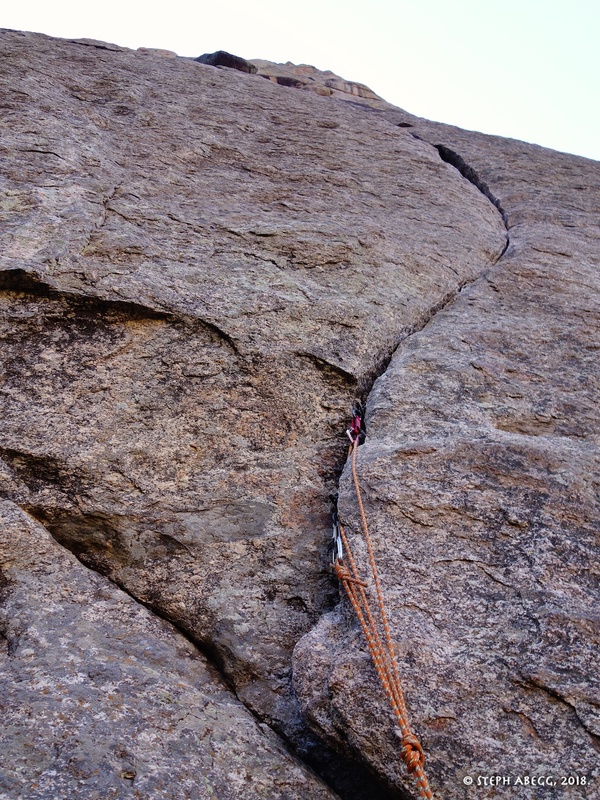 The 5.8 traverse at the start of Pitch 4. 14. 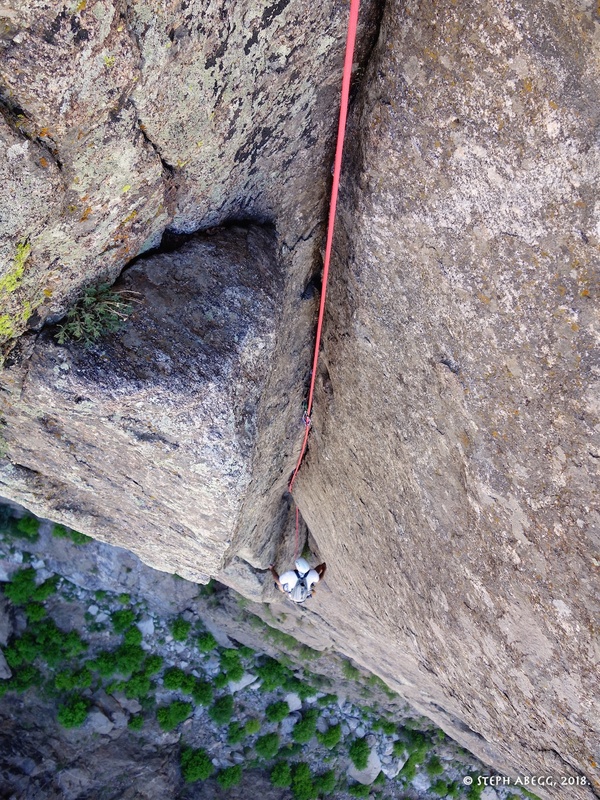 Looking down the 5.9 corner on Pitch 4. I always like flared corners, since I can climb them straight in and get really secure jams the entire way up. Larger people probably have to stem or one-arm jam the corner, which probably makes the climbing a bit harder. 15. 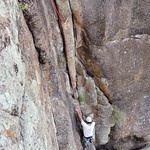 Tony nearing top of the 5.9 Pitch 4. 16. 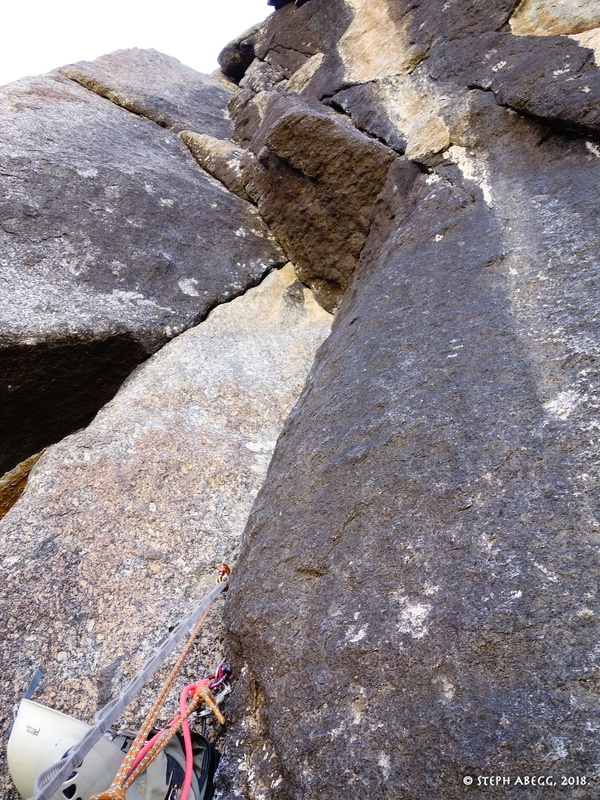 Looking up the Black Corner variation (5.10) on Pitch 4. This way looks fun too. 17. 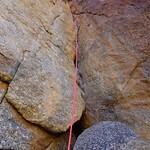 If you do the Black Corner variation, you traverse left on this hand rail system to get to belay. 5.9+. Climb up easy ground and pull the bulge up and right. 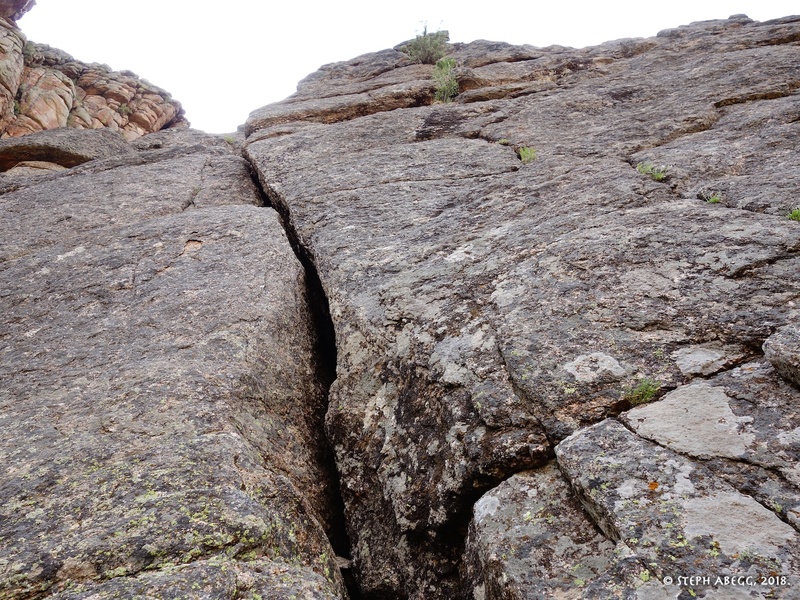 Then move right to the base of the tall left facing corner and climb the corner (5.9+) to the large ledge below Lightning Bolt Crack. 18. 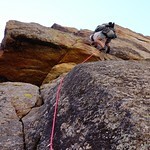 Tony on the 5.8-ish bulge on Pitch 5. 19. 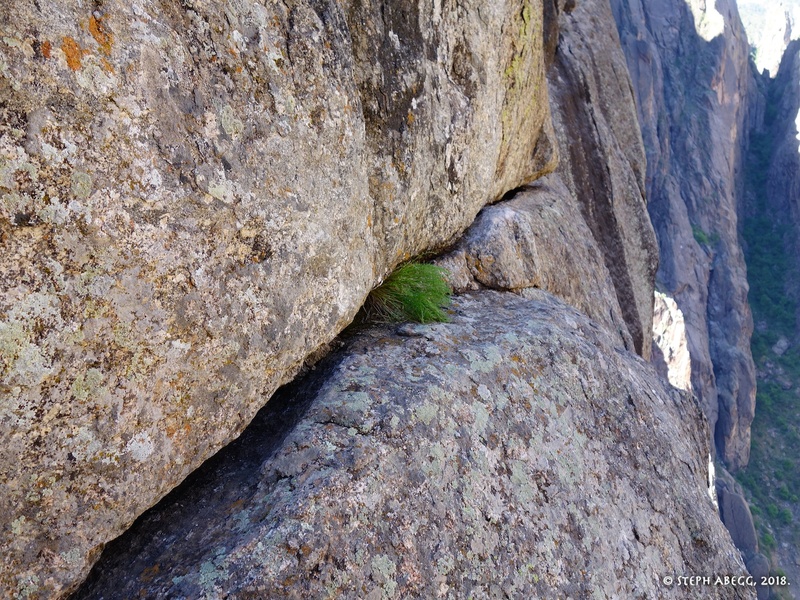 The steep corner on the second half of Pitch 5. 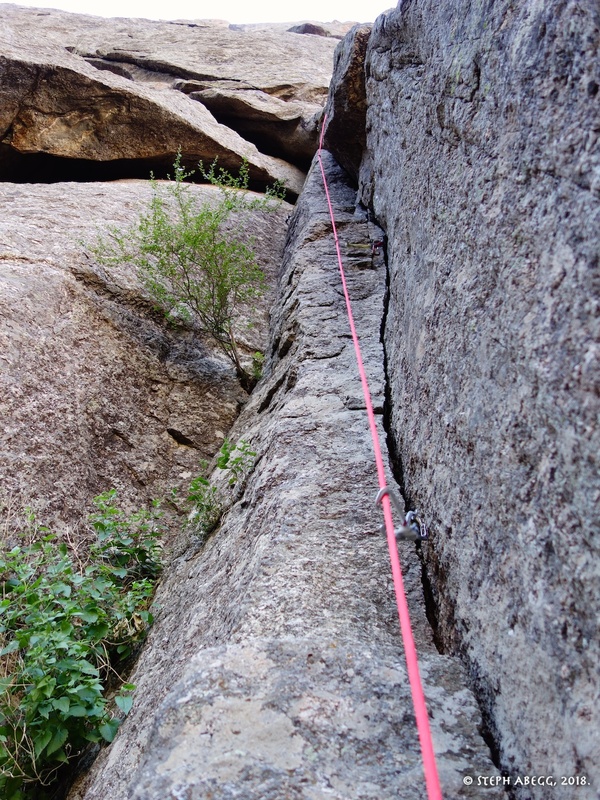 The 5.9+ crux is near the top. 20. 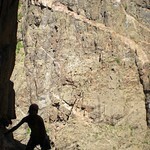 Steph finishing Pitch 5, silhouetted against the sunny walls on the other side of the canyon. Photo by Tony. 5.9+. 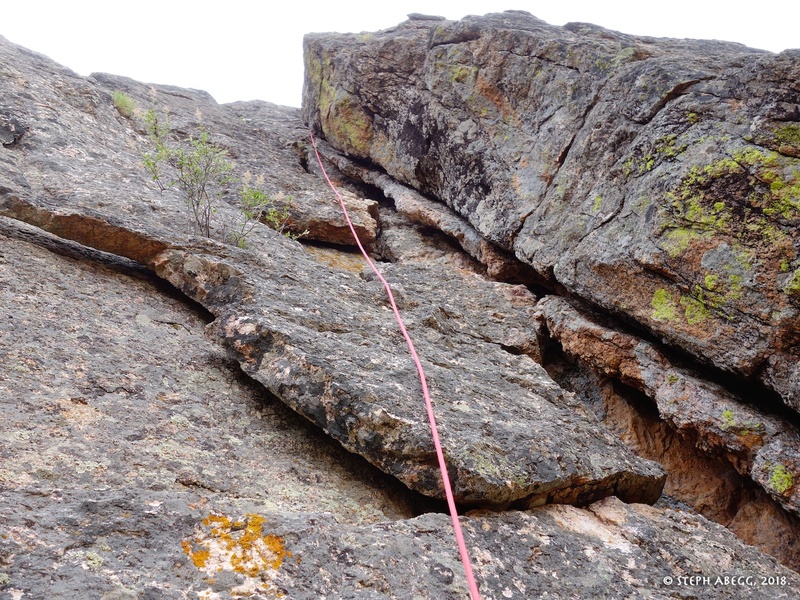 Climb the grungy but well-protected corner (climbs better than it looks) to a short pegmatite section, and a belay ledge on the right. 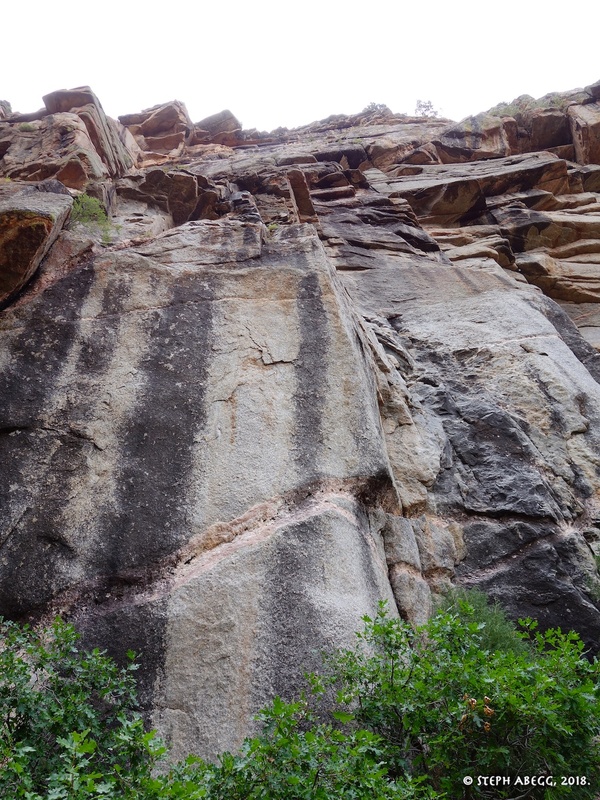 Variation: Climb the striking Lightening Bolt Crack (5.11) on the overhanging right wall, sharp, strenuous, but well protected. 21. 21. 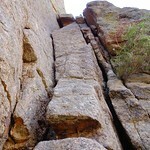 Looking up the 5.9+ corner at the start of Pitch 6. This corner is a bit dirty, but the climbing is actually quite good. 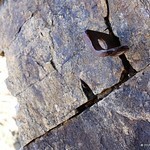 Lightning Bolt Crack (5.11) is on the right. 5.7. 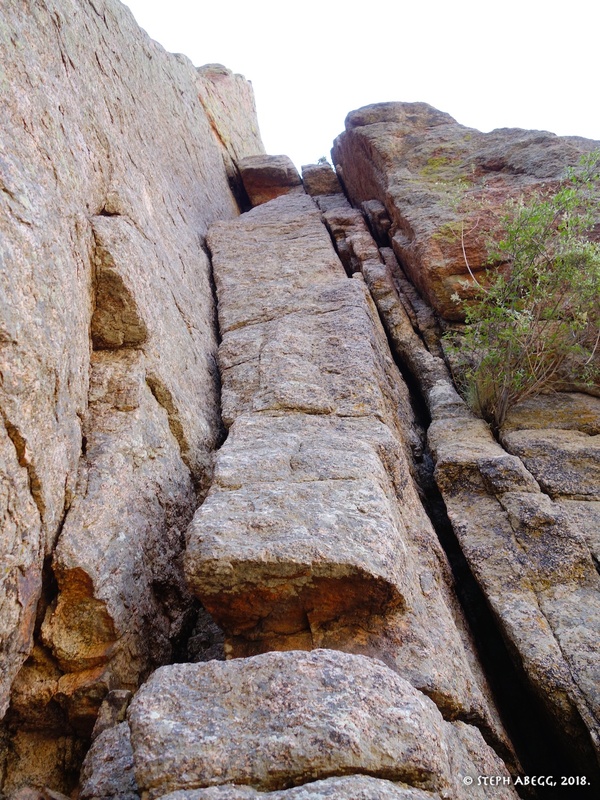 (300' or more): Climb the lower angle, but at times runout, wall above to the top of the summit ridge. 22. Somwhere on the upper two pitches (Pitches 7-8). 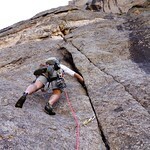 This is moderate (5.7 or so) climbing to top of Comic Relief Buttress. 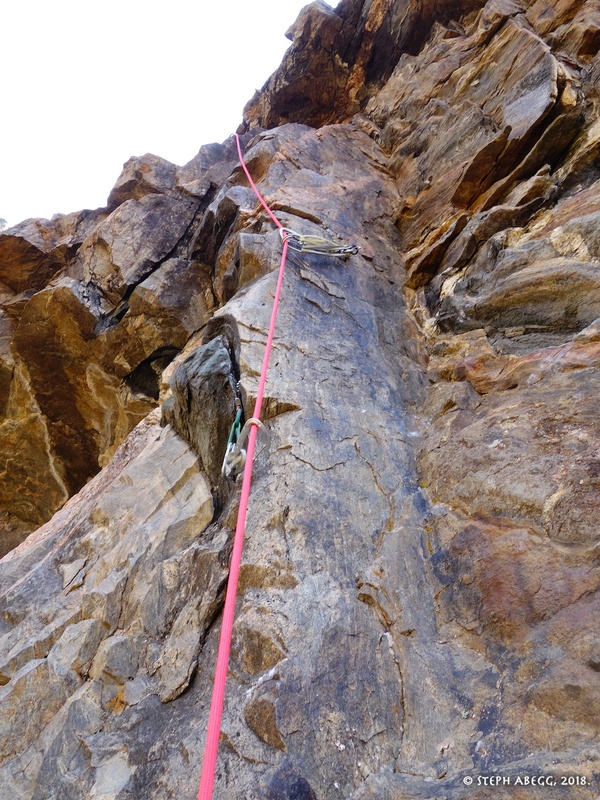 I had extended Pitch 6 into a long pitch to eat up half of Pitch 7, and Tony led the remainder of Pitch 7 plus Pitch 8 to the top (with perhaps 50 feet of simulclimbing on our 70m rope). 23. 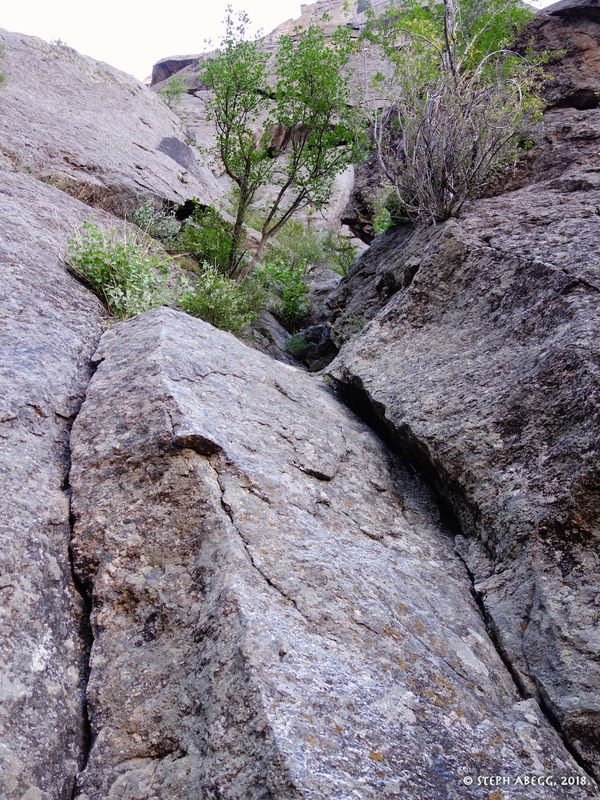 Cool quartz band on Pitch 7 or 8. 24. 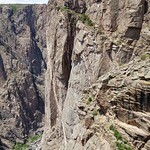 Steep and rugged walls of the Black Canyon of Gunnison from high on Comic Relief. 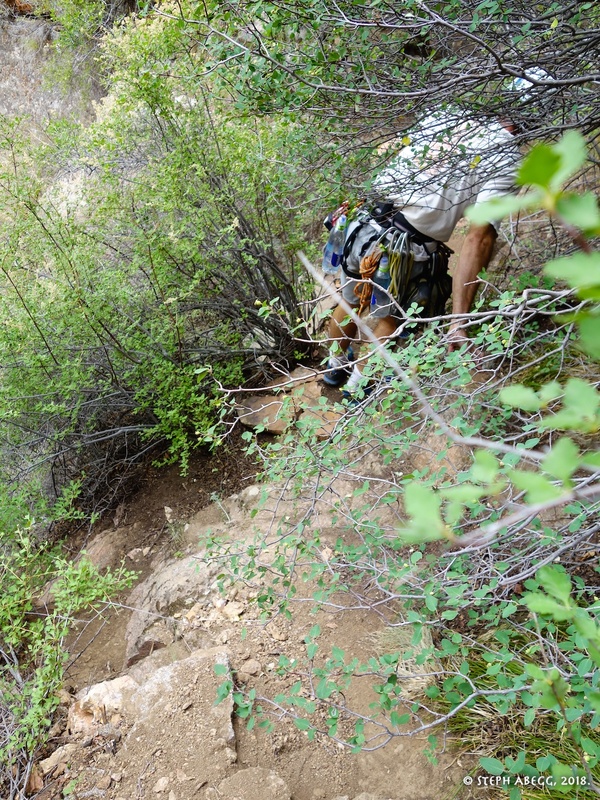 You can scramble up a gully back to the campground, or climb 2-3 pitches of easy 5th (up to 5.8) to the rim ("Escape Pitches"). 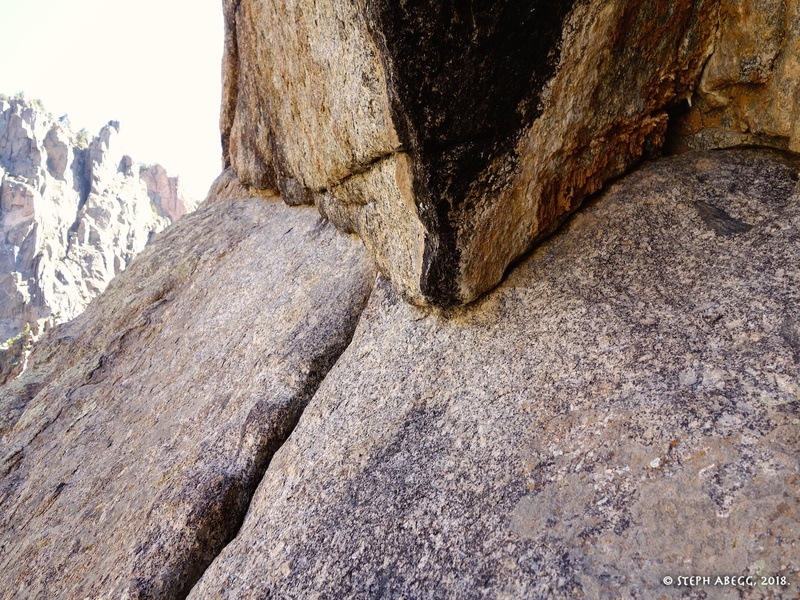 Either requires a short rap to get off the top of Comic Relief Buttress—use the left rap anchor for the gully scramble and the right rap anchor for the Escape Pitches. 25. 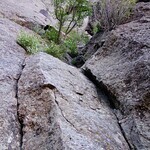 The gully you can scramble up to get back to the rim. 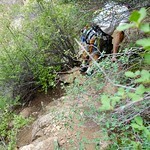 The hot slog up this gully did not seem appealing, so instead we climbed the Escape Pitches to the rim. 26. 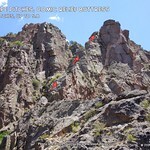 An annotated photo showing the Escape Pitches up the ridge to the rim. This took 2-3 pitches, mostly 4th with a couple of 5.7-5.8 moves. 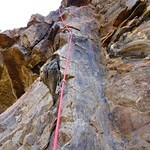 Although the climbing itself was nothing to write home about, it beat the hot slog up the gully. 27. 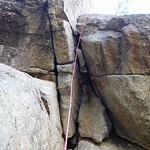 Rap anchor at top of Comic Relief Buttress. This is the right-hand anchor that you use if you choose to do the Escape Pitches to the rim. 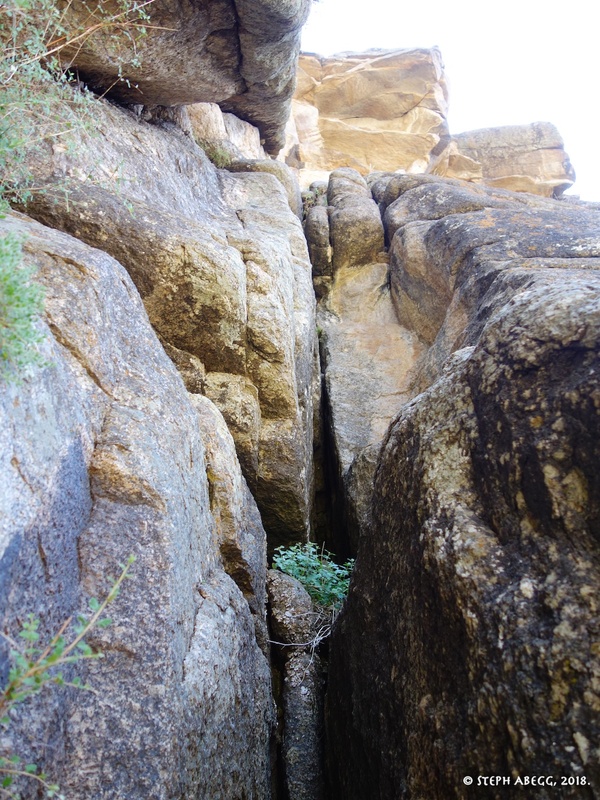 Make a short (~20 foot) rap to gain the side across the chasm. Apparently gutsier people then me tie into the rope and jump across. 28. Nearing the top of the Escape Pitches up the ridge to the rim. 29. 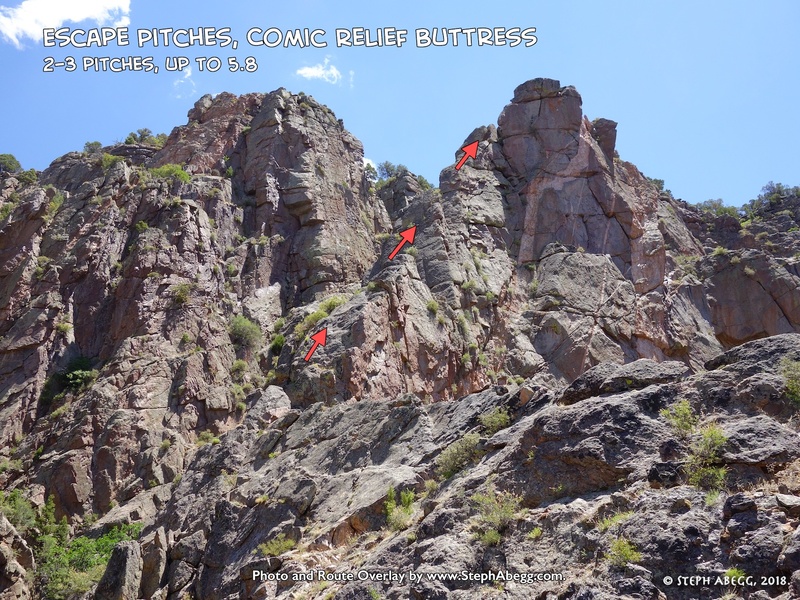 As we were climbing the Escape Pitches, we joked about how cool it would be if we popped onto the rim right at our campsite (Campsite #4). And then we did! 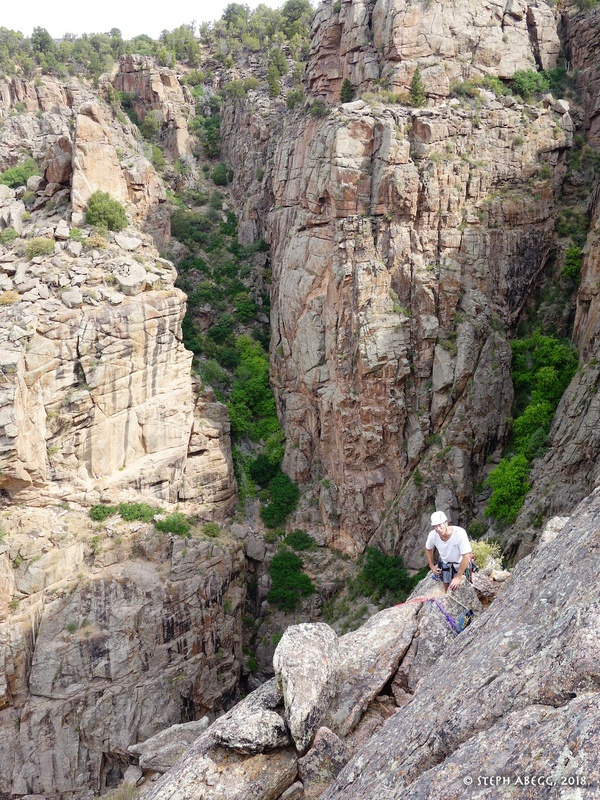 A great intro to Black Canyon climbing. An obvious line, entertaining, not very sustained or long, and (mostly) excellent rock. 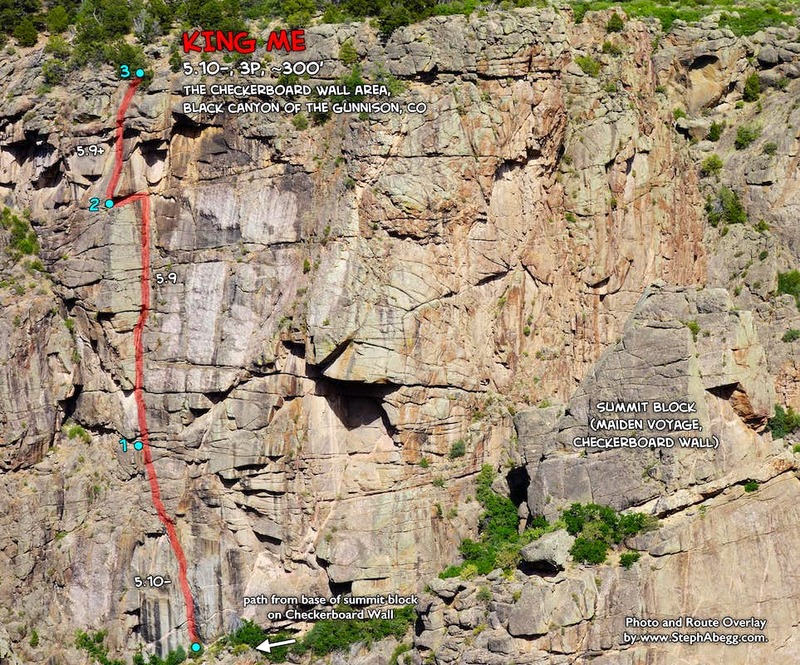 Descend the Cruise Gully, which involves scrambling and two rappels (fixed lines in 2018). 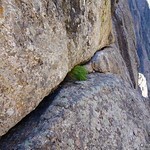 The Checkerboard Wall is obvious and a short distance from the base of Cruise Gully. 1. 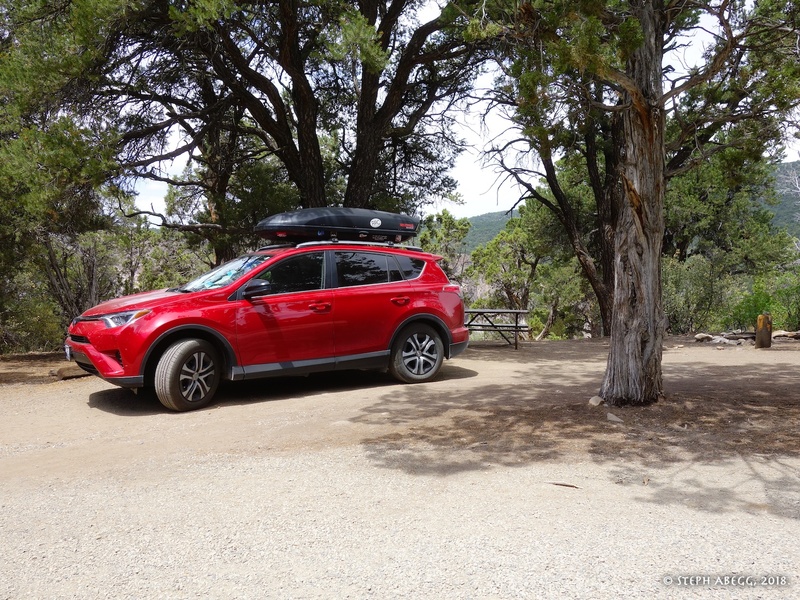 The start of the Cruise Gully is on the road between the campground and Ranger Station (right side as you head away from campground). 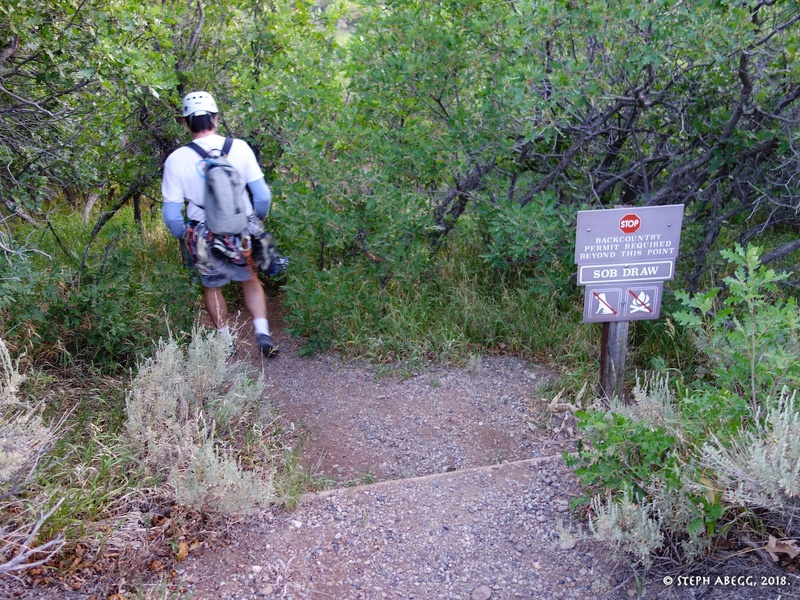 You cannot see the sign from the road, but the trail is obvious and starts a bit after the trail to the SOB Gully. 2. 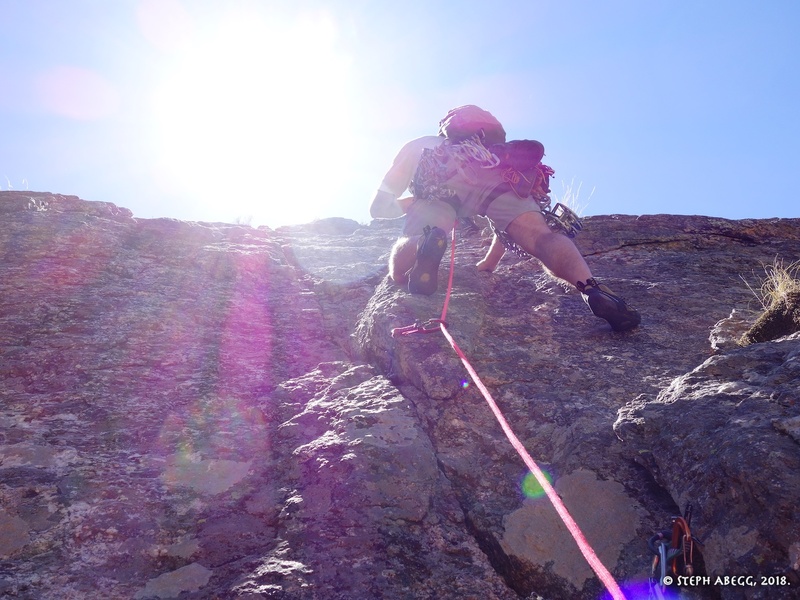 First of two rappels in Cruise Gully. Both were fixed lines for us. 3. 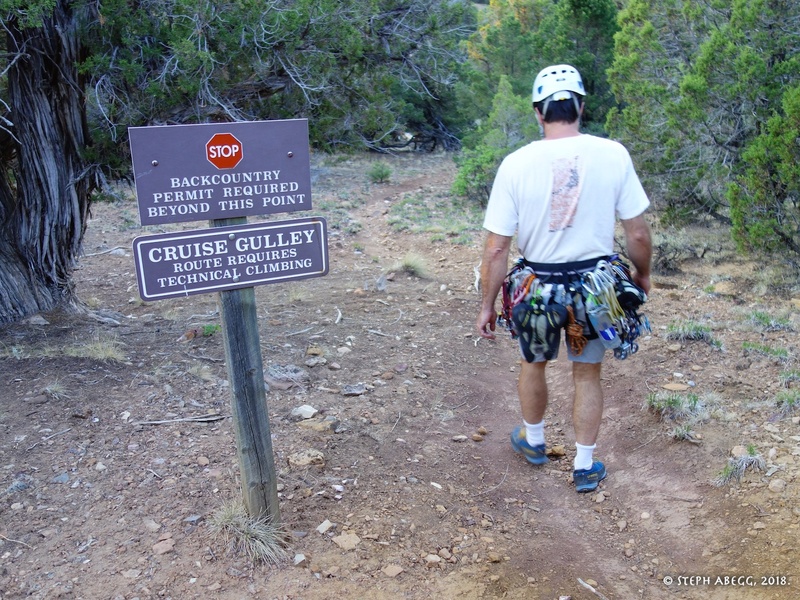 Cruise Gully as seen while climbing Maiden Voyage. 4. Looking up Maiden Voyage from base of Cruise Gully. 5. 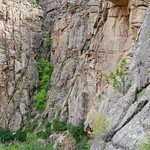 North Chasm View Wall, East Face. 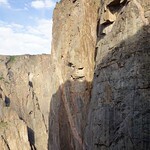 Scenic Cruise, Journey Home, Midsummer Night's Dream, and Leisure Climb (among other routes) go up this impressive wall. It was just too hot to climb anything in the sun on this trip. 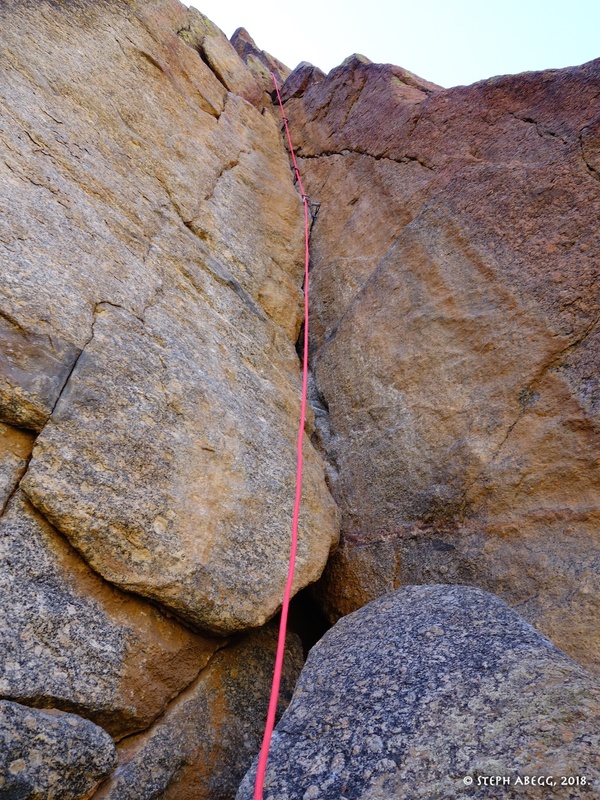 5.9 (crux). 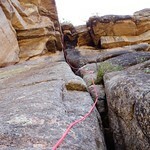 The start of the route is the worst part of the route, ascending a dirty face into the crack system. 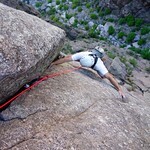 Continue up, climbing through a roof (crux) and up some more to a belay spot below a wide crack. Some parties break this into two pitches. 6. Starting up Pitch 1. 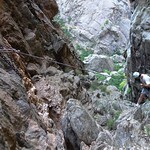 The route looks rather uninspiring for the first 50 or so feet and then it gets better. 7. 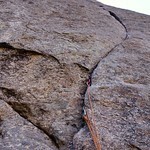 The 5.9 crux roof. 5.8. 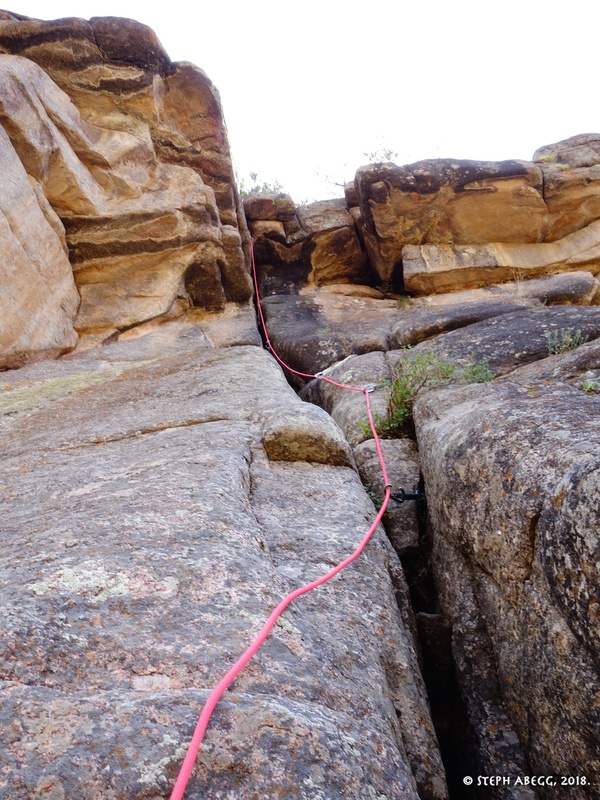 Ascend the obvious wide crack, go around a roof to the right, back left to go around the next roof, then up some fun double cracks. 8. 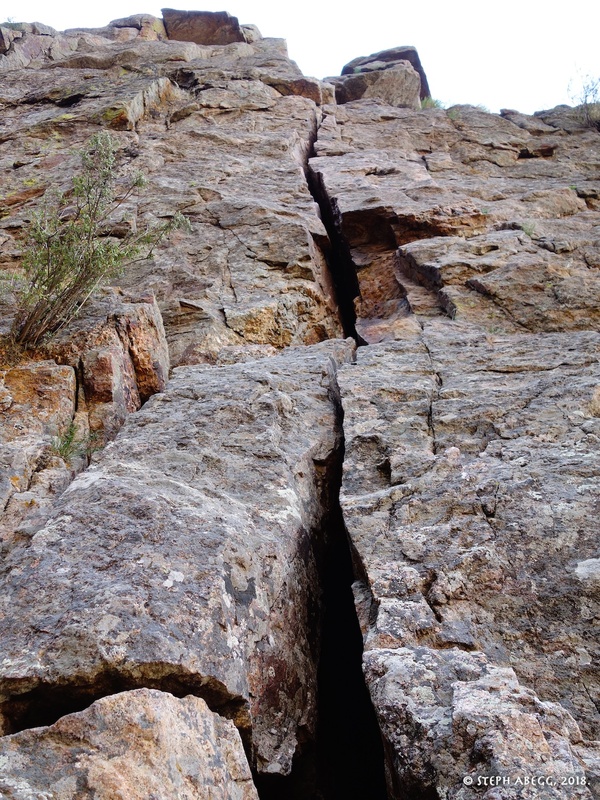 The wide cracks 5.8. 9. The double cracks. 5.8. 5.7. 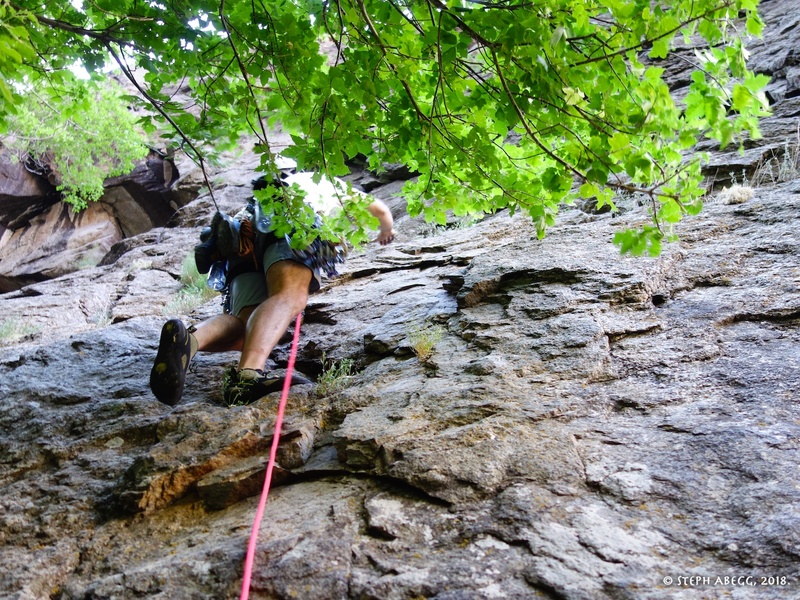 Climb up the huge easy dihedral to a large ledge with trees. 5.6. 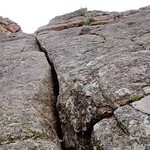 The route finishes up the summit block above with an obvious crack and corner over on the left. 11. 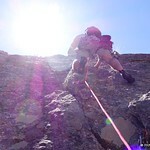 The start of the pitch up the summit block. 12. 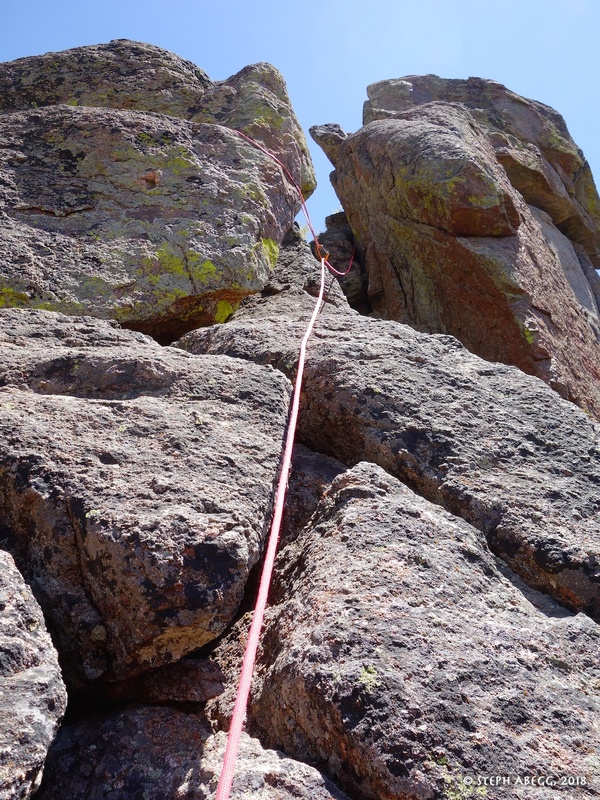 Second half of the pitch up the summit block. 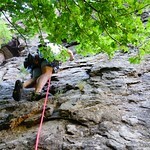 Rappel from the summit block back to the ledge. 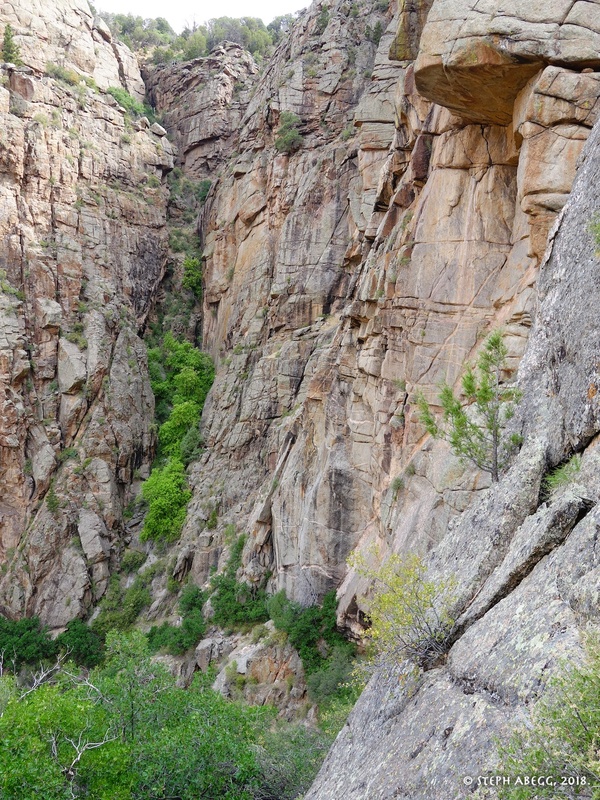 From here, you can either (1) hike across a forested ledge and then scramble up an exit gully to the rim or (2) hike only half-way across the forested ledge and climb King Me to the rim. 13. 13. From top of Maiden Voyage. 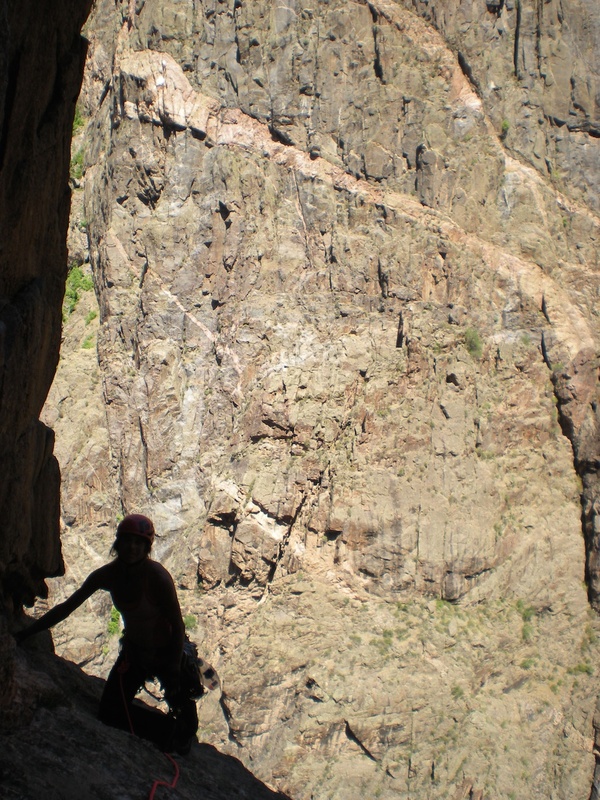 Exit gully in the background (or climb a route like King Me to the top instead of slogging out the exit gully). A great way to get to the rim after climbing Maiden Voyage. 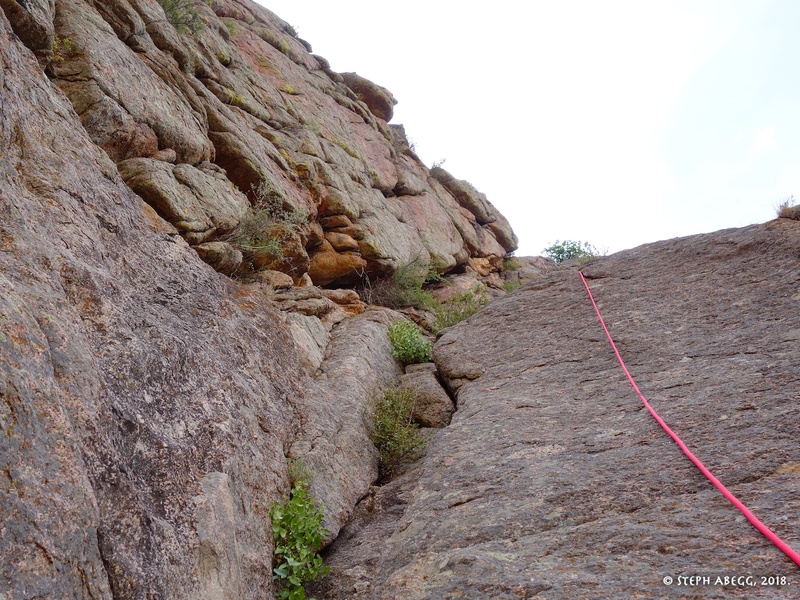 Excellent face climbing and fun wide cracks and a level harder than Maiden Voyage. 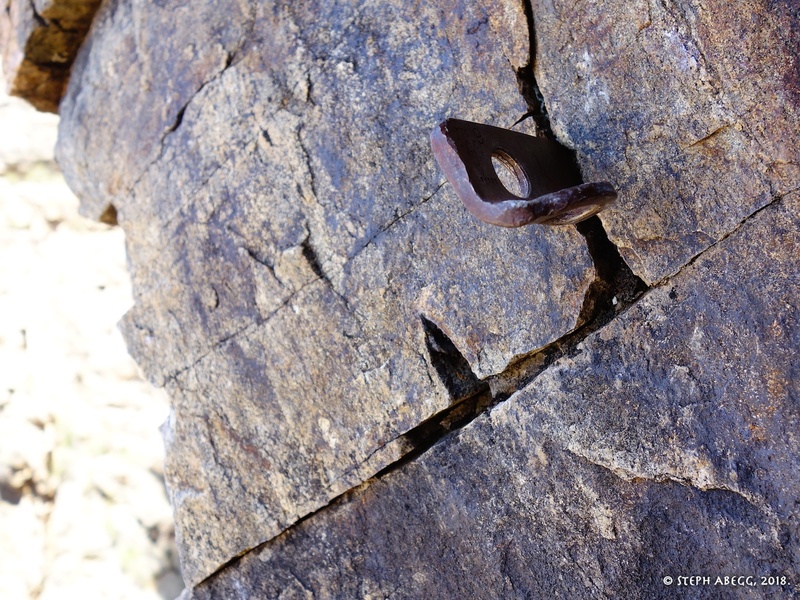 Hike <10 min on a forested ledge from the base of the summit block of Maiden Voyage to the base of King Me, which starts just right of some obvious vertical black streaks (you cannot see the streaks until you are starting to pass by the route). 1. 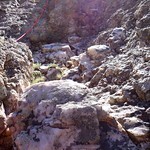 The path between the base of the summit block of Maiden Voyage and the base of King Me. 2. King Me starts just right of these obvious black streaks. 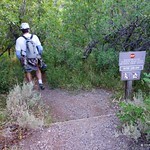 You cannot see the streaks until you are starting to pass by the route. 5.10-. 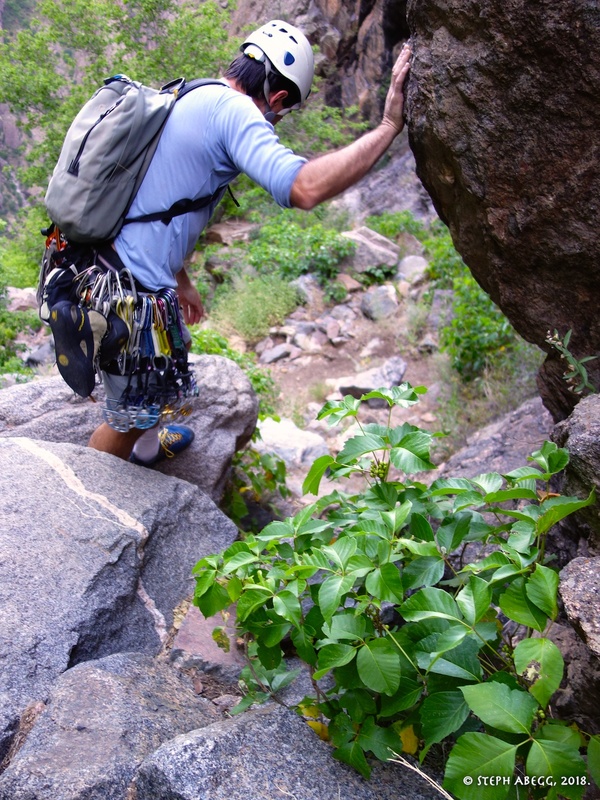 Climb up a steep face, past a fixed pin, and up and left to a ledge below the large right-facing corner. 3. Tony starting up Pitch 1. 4. Midway up Pitch 1. Note the fixed pin for pro. 5. Fixed pin. Might want to tie it off closer to the wall to avoid too much levering action if you did happen to fall on it. 5.9. Climb just right of the large, right-facing corner. 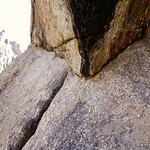 At the end of the corner, traverse left under a cool nose feature. 6. Looking at the giant right-facing corner from the top of Pitch 1. 7. The climbing up the corner better than it looks. 8. Climbing the corner. I thought this was a fun pitch. 5.9+. 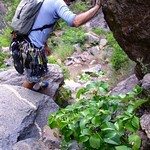 Climb up an offwidth to a hand crack through a small roof to the rim. 9. 9. Pitch 3. The roof is at the top of the pitch. You top out on the rim. 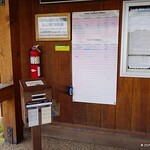 From here, it is a quick hike back to the road between the Ranger Station and the campground. 10. 10. 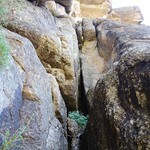 North Chasm View Wall, East Face. 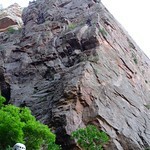 Scenic Cruise, Journey Home, Midsummer Night's Dream, and Leisure Climb (among other routes) go up this impressive wall. It was just too hot to climb anything in the sun on this trip. 1. 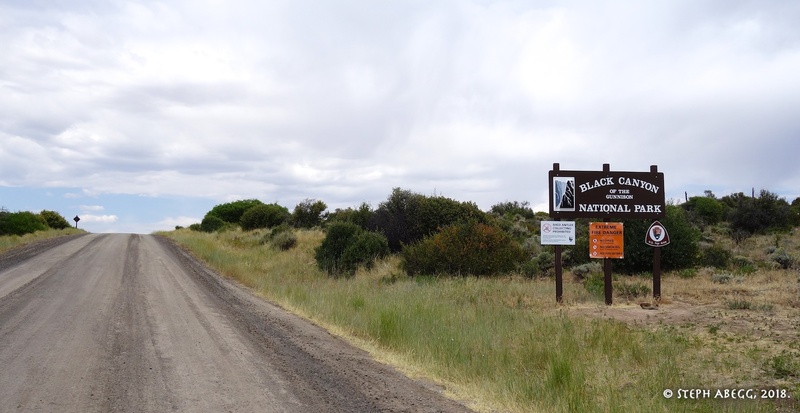 Road on the way to Black Canyon of Gunnison. 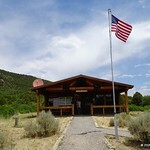 Doesn't quite feel like the standard tourist-overrun national park! 2. 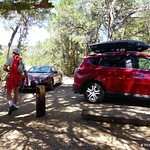 Campground on North Rim. Very pleasant camping. 3. 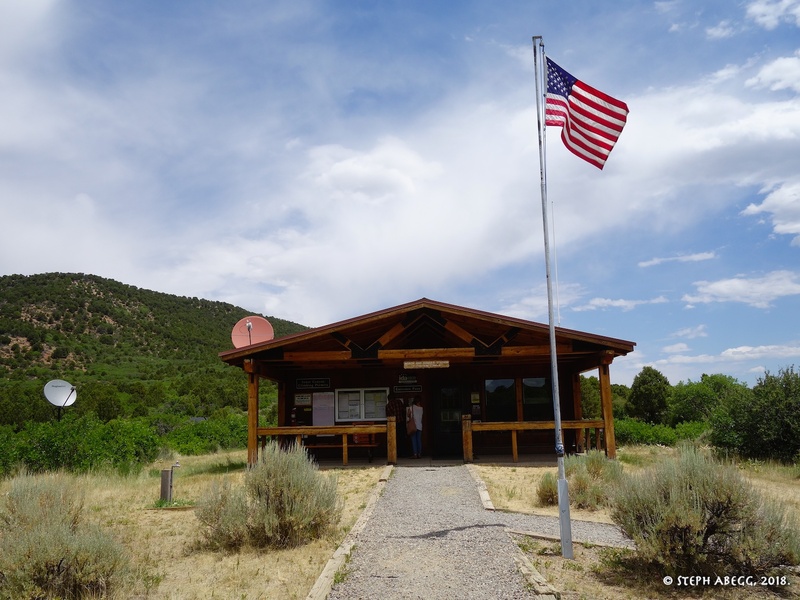 Ranger Station on the North Rim. 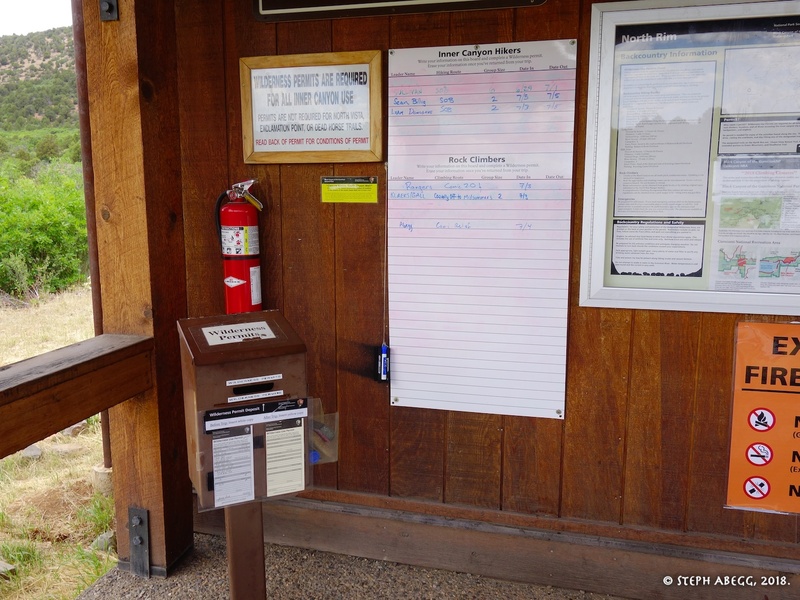 Most times when I went down there it was not staffed, but on one occasion it was and the ranger was happy to photocopy a route topo from the guidebook for me. 5. 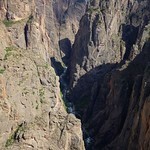 Looking down the deep and narrow Black Canyon of Gunnison from the left overlook on the Chasm View trail at the campground. So much rock.